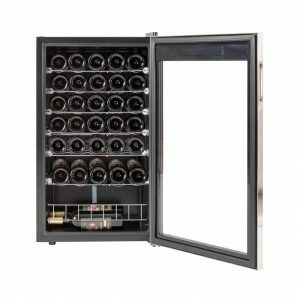 Smad JC-95E is a 35-bottle capacity single zone wine cooler/cellar with an efficient and powerful compressor, no frost cooling and a standalone design with a stainless steel frame. You have the option to purchase the 19-bottle (JC-62E), 28-bottle (JC-88E) and 35 bottle models with or without handles. You can fit the 35 bottles on its 5 wire and 2 half wire shelves. There is an LED display panel with temp up and down touch control buttons and the light switch and the blue LED read-out. You can switch between Fahrenheit and Celsius, whichever you’re familiar with. 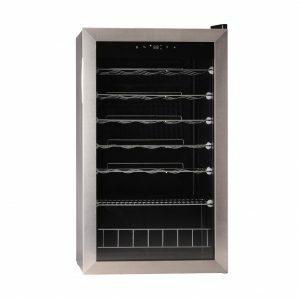 Smad Wine Cooler looks nice and modern with the stainless steel door frame with a recessed handle. It weighs 48.5 pounds and measures 18.9 x 19.3 x 33 inches, with the internal dimensions of 16.1 x 14.1 x 28.7 inches. It has a 95 liter or 3.35 cubic feet capacity for up to 35 standard sized Bordeaux style bottles. The noise level is 40 decibels, meaning it runs fairly quietly. The energy efficient modern compressor has the 85 watts power (110 Volts and 60Hz). Smad is a reputable home appliances brand with two decades of history with fridges, car coolers, wine coolers and other electrical products. It has a tempered and original transparent glass door with a stainless steel door frame with a recessed handle. The ambient temp range for this unit to function properly is ≤90℉ or 32°C. And the internal temperature range is between 39 and 65 degrees Fahrenheit (4 and 18 degrees Celsius). You can adjust the shelves or remove one or two to fit in different size- larger or weird shaped bottles. The lower section is for the larger bottles and all the bottles lat down. Please make sure the door is wide open when you’re pulling out the racks or the door gasket may get damaged. 12-18°C (55-64°F) is suitable for red bottles and 4-18°C (39 – 65°F) is good for white and champagne bottles. Please make sure there is enough room for ventilation at the rear and on the sides. You can view the actual temperature of the interior as well as the temperature you set it to. And it works well without the compressor doing too many cycles and noise. You don’t need to drain out any water, it is simple plug and play. You need to adjust the feet of the cooler level and allow at least two inches of space on the sides and the back. Please keep it away from heaters, stoves, radiators (any heat sources) and any direct sunlight. The temperature can naturally be a little warmer at the top than the middle or bottom levels. But it works and cools very nicely overall. Smad 35-bottle Wine Cooler is shipped packaged very well and may take a bit of effort to remove it out of the box. But once it is out the cooler looks nice and modern and takes a short time to set it up. You’ll only hear slight humming when the compressor is on and doing cycles- it runs very quietly. It has the blue LED lights inside but they are not very bright and do not really illuminate the bottle properly. It comes with a superior customer support that offers satisfactory solutions to your problems. Some customers complained about not being able to fit five bottles on each shelf, but this may be due to the size of their bottles.